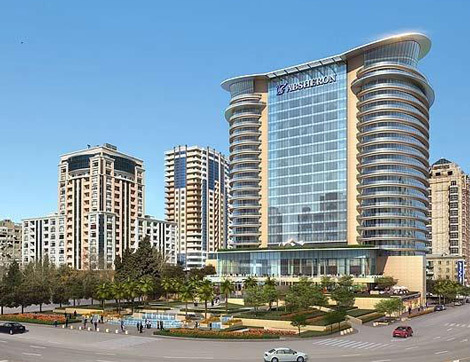 The JW Marriott Absheron Baku in Azerbaijan has begun a soft opening period this month with the full opening occurring in September. The hotel is the seventh luxury hotel to open in the city in the last 12 months, with other entrants including Jumierah, Hyatt and Hilton (to read more articles about Baku on businesstraveller.com, click here). The 243-room hotel has views of the Caspian Sea, as does its 21st floor Absheron Spa. The property has 15 meeting rooms including the Sharg Zali ballroom, with a seating capacity of 1,200. The opening marks a busy period for JW Marriott as it prepares for the JW Marriott Marquis Dubai, which will be the world’s tallest hotel when it opens in Autumn 2012, and the JW Marriott Cusco, which among its 153 rooms constructed around the ruins of an historical ancient Inca village, will have seven suites equipped with supplemental oxygen system. Nevertheless, Mitzi Gaskins, vice president brand management for JW Marriott told Business Traveller that the brand was focussing on growth in Europe. “It’s the continent that we have the least amount of hotels in and we are looking to grow there,” Gaskins said, and listed “Paris, Madrid and several locations in London” as being targets. Gaskins said that JW Marriott is the luxury brand that Marriott International can grow in Europe since there are restrictions with the Ritz-Carlton brand [because of the Ritz hotels in Paris, London and Madrid]. There are 30 new JW Marriotts in the pipeline, Gaskins said, with over half of these in Asia. Gaskins said that the brand’s preference is for new builds rather than conversions, something which may slow its expansion on the continent, but that although a rebrand of an existing Marriott hotel is unlikely, JW Marriott might look for new opportunities by rebranding independent hotels or those from other brands. Gaskins says that JW Marriott is perceived differently by customers from Marriott’s other luxury brands, including Ritz-Carlton, which sits in a super luxury set which includes the Peninsula and Four Seasons. In contrast, JW Marriott is in a mid-level luxury tier including Sofitel, Shangri-La, Fairmont and Conrad. JW Marriott is certainly a “flexible brand” with hotels having as few as a 100 rooms and as many as 1,600, and including both city and resort locations. For more details on the new Baku property, visit jwmarriottbaku.com.